Art criticism, whether written by professionals or fans, is plagued by nonspecificity and a lack of self-justification. Things are implied to be good or bad, without a very good explanation for why we should consider them good or bad. For example, why is an “unrealistic character” a bad thing? How about “emotional dishonesty” or “implausible scenarios”? How about killing characters to prove seriousness? How about bringing characters back from the dead to please your audience? What about music that’s too loud or a scene that’s sexually violent? What about something that “celebrates the laborer” or something that is about “the relationship between abstraction and figuration”? I believe it is the confusion of these categories and not the idea of some qualities of artistic goodness being quantifiable or describable that is misguided, and it’s a lack of good vocabulary for what art actually does that continues to make these categories so mercilessly tangled. I’m going to start today with number five, the relationship between realism and artistic goodness, and I’ll work my way through the others in subsequent posts. What do we mean when we say a work of art feels real? Emotionally real? Factually real? (Is there a distinction?) The Dardenne Brothers are very, very good at what they do, and so have been any number photographers, documentarians or 17th century portraitists. But those artists don’t feel any more artistic or vital, per se, than Picasso or Lord of the Rings. Realism seems to rank about as high as being made more than 100 years ago as far as getting your work of art appreciated goes. So what are some better words? In his Formal Theory of Creativity & Fun & Intrinsic Motivation, AI scientist Jürgen Schmidhuber suggests the idea of “compression” as the explanation for both why art exists and why it is pleasurable. The gist of Schmidhuber’s concept of compression is that the human brain is itself a kind of hard drive with a limited amount of space. Given that the brain is space-limited, it makes sense that information that uses that space efficiently might reward the brain with pleasure. It’s in our interest, in other words, to find patterns so that we can get rid of extraneous data and use our brain for more things. This reward system explains why things like stereotypes (all people are X) or religion (everything happens because of X) feel good; it also explains why we’re drawn to symbolism, metaphor, and succinctness. 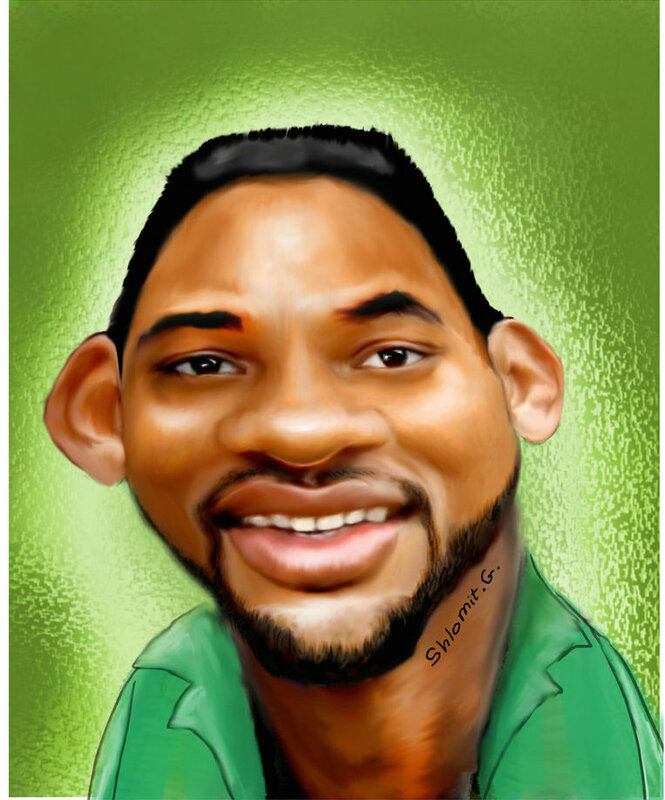 Due respect to the artist of the image on the top, but the caricature of Will Smith isn’t very good compression because it doesn’t tell me anything about Will Smith. It’s just Will Smith with a kind of wider face. Except Will Smith doesn’t even have a wide face! 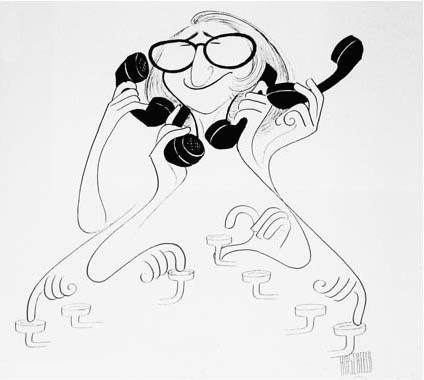 The Hirschfeld is pretty good compression though, because it tells me that the person depicted was very busy all the time but also fairly good humored about it. That’s a lot of information, when you think about it (including abstract information), for an image that isn’t even strictly realistic and uses few lines and no colors. WOMAN 1: The wheat had died. The blight came and we had to burn it. And we still had corn. We had acres of corn. But, uh… mostly we had dust. WOMAN 2: I guess I can’t describe it. It was just constant. Just that steady blow of dirt. WOMAN 3: We wore, um… little strips of sheet…sometimes over our nose and mouth..so that we wouldn’t breathe so much of it. MAN: Well, when we set the table, we always set the plate upside-down. Glasses or cups, whatever it was upside-down. Exposition, like caricature, is a good way to measure compression, because it’s a realm where an author always needs to convey a lot of information in a small amount of space. So what information is this exposition giving us? Of those three pieces of information, it seems like only the last is necessary. Moreover, it’s unclear how we’re benefiting from being told that people had to turn their glasses upside-down, when the movie goes on to also show these things happening. Not only could those 5 minutes of film have been removed, the movie continues to hit the “it is the dust bowl” talking point again and again throughout the film, a unit of information that gets repeated without additional depth being added. What about Alien, a movie also set in a weird and future universe, in which you’d think even more time would need to be spent on exposition to catch a viewer up to speed? Alien begins with a slow pan over the richly-realized, lived-in world of the Nostromo. We see containers of food, spacesuits, an overall aesthetic of practicality. The ship turns on, the crew reawakens. In five minutes we experience world, mood, and narrative. We learn as much, if not more, in those five silent minutes than in the first half hour of Interstellar. Similarly, the picture of Will Smith only gives us literal information (what Will Smith looks like, more or less). Compare this to the abstract information Hirschfeld gives us: what Clara is like, what aspects of her stand out, Hirschfeld’s attitude towards her. Interstellar tends to facts and Alien to abstraction. Interstellar needs us to know the bullet points—wheat blight, dust, cups–and how to feel about them–bad?–and strangely leaves us with less information about either the world of Interstellar or the world we actually live in. “Show, don’t tell” is a classic maxim because it intuitively understands the principle of compression. Alien shows us in specific ways what living on the Nostromo is like, and that approach accomplishes two things: it gives us richer information, and it gives us more organized information. Interstellar gives us shallow information, and too much of it. There’s also a type of even more ephemeral, abstract information that gets transmitted in well-compressed art, that’s something like “attitude towards the world,” and its medium is style. In the case of Hirschfeld, that attitude is a kind of sardonic whimsy. In the case of Alien’s opening, it’s a sense that beauty is a complex, intriguing quality that can be found in mundane places. Alien indulges in strange flairs like a series of jazzy jump cuts as the lights from the ship’s rebooting computer flash over an empty emergency helmet, followed by sweeping orchestral music as the crew reawakens from their cryosleep. In other words style, despite seeming like excess, is actually often the essence of saying things efficiently. If compression is density of information, bandwidth is volume. How much information could a work of art store, ideally, and what kind of information? Both The Wire and “Drug Addict” by Duane Hanson are about the human consequences of drug use. In exploring this general topic, The Wire crafts a tremendous narrative that helps us understand the systems that create and interact with the drug trade. It understands that “systems” occur at multiple scales: at the personal and interpersonal level, the small community level (like families or workplaces), on up to bigger and more complex levels, like a school system, city government, or organized gang competition. The Wire isn’t a character story, precisely, but it understands that the concrete and human levels are necessary for understanding how the more complex things come to be, as well as what the consequences of those complex things are. It presents a picture of reality that makes it very hard for a viewer to have simplistic thoughts about that reality. “Drug Addict” isn’t the same level of excellent relative to fine art the way The Wire is relative to television, but it is good enough to be illustrative. The work is an extremely life-like sculpture of a man slumped against a wall with a needle hanging out of his arm. When you walk by it in a gallery, you think for a long moment that the man is actually real. The point of the sculpture is to make an invisible population of drug users abruptly present and human. The viewer is meant to suddenly confront their biases (were they angry that a man like that was in a gallery? ), and perhaps be more persuaded to care about invisible people or harmful systems. The information “Drug Addict” provides is complex for what it can provide, but The Wire provides objectively more. Moreover, The Wire and “Drug Addict” are specific in different ways. “Drug Addict” is fairly precise and successful in the way it confronts the human tendency to objectify, but doesn’t make it much easier or harder to have simplistic thoughts about drug abuse or class differences. Even the most absolute perfectly complex version of “Drug Addict” would still probably provide less information than The Wire. In other words, narrative art forms like novels, plays, film, television, etc. are of the higher bandwidth variety, while more figurative mediums like painting are lower bandwidth. “Low bandwidth” sounds like a criticism, but I want to be clear that that’s not the case. High bandwidth art forms are better for conveying complex information about the systems that make up reality. Low bandwidth art is better for conveying complex moods and practicing stuffing large amounts of symbolic information into an inherently limited space. Low bandwidth art is compression practice. A painting or a song can give very complex mood or emotional information; moreover, it requires less information and time to understand. Dostoyevsky is highly information-dense, but the further we are from 19th century Russia, the fewer tools we have to absorb that density. He also takes a while to read. Low bandwidth information also diminishes without context, but its intended impression tends to remain very much alive. I’m reminded of the urban legend of the Peace Corps volunteer who intended to impress the locals with the great artistry of Hamlet, and was disappointed when they laughed at Hamlet’s actions as stupid and illogical, and I compare it to the popularity of Cycladic figurines despite the fact that we have no idea what they represent or why. So bandwidth represents a trade-off: either more details that necessitate more contextual knowledge and time commitment, or more universal and more convenient ideas, but less specificity. I don’t think I care about declaring whether Black Square is good or bad art, but it does something that plain realism, plain “stylization” or even plain pattern can’t do. Like writing the letter A on a canvas, it forces a thought process about what a plain black square could possibly represent. How much meaning can we shove in there? None? Too much? A major part of modern aesthetic discourse concerns stimuli that ‘resonate’ with many previously disconnected things one has encountered, felt or thought, and in so resonating reveal new affinities between these previously disconnected things…These aesthetic merits are often understood to be closely related to the capacity of art to define new concepts via prototype (cf. Shelley, Coleridge, Carnap, Dilthey): when the novel affinities revealed by an artwork are sufficiently strong, one talks about an artwork ‘articulating’ a general phenomenon or pattern that is otherwise hard to pin down, or about an artwork serving as the prototype that defines a category that is hard to otherwise define. (E.g. ‘Kafkaesque experience’, ‘Pinteresque conversation’, ‘Orwellian society’. )…For example, it is often stated that Kafka’s short stories capture a structure of experience — the ‘Kafkaesque’ — that one finds in a range of disparate experiences (or conceptions of experiences), making a Kafka story equally evocative of e.g. the experience of going to the bank, the experience of being broken-up with, the experience of waking up in a daze, the experience of being lost in a foreign city, or the experience of a police interrogation. Just as the experience of finding correct organizing principles fills one with pleasure, the experience of an insufficient organizing principle can fill one with dread and revulsion. This experience of pleasure and revulsion goes a long way towards explaining the experience of a work as “good” or “bad” because the experience of a work being good at compressing reality is also related to skill (compression is difficult) and morality (a falsehood is dangerous or a truth is valuable). Just because our brains are limited doesn’t mean the data it can’t store aren’t potentially significant. In Schmidhuber’s words, “You shouldn’t throw away any of the data, if you can.” But a pile of data isn’t actionable the way sorted data is. Compression is not argument, per se, but because it involves the sorting of data, it sure can feel like argument, and this makes it feel like morality. Compression allows us to put information to use. To act, you need to come to a conclusion (however good or bad the conclusion is). Thanks as always to Gabriel Duquette for his help in developing some of the ideas in this piece. I’m interested in slightly decompressing the relationship between compression and action. Compression is always relative to some algorithm for decompression- in the case of art this consists of a collection of hard-wired sensory mechanisms and higher -level socially absorbed behavior. Natural selection acts only indirectly on thoughts or internal experience by selecting for the external action patterns that those thoughts generate. This is captured in William James’s famous adage that “thinking is for doing.” So it seems to me that if art really does work in that formal of compression that it should be our most effective tool for getting people to do things. But it is worth noting that none of the five classes of “goodness” that you laid out at the beginning of the post make reference to doing anything. If I were more cynical I might say the only difference between art and advertising is that the latter actually makes something happen. Art could be defined as the class of things best compressed for human use that don’t actually lead to usage. I’ve said this elsewhere, but things that are art-like seem to come in three forms: craft, art, and propaganda, and the distinction between the three has to do with their relationship to action. “Propaganda” is directly related to action. It exists to ensure a particular course of action, and advertising, as you note, falls into this category. Advertising exists to get people to buy things, and a pamphlet exists to, I don’t know, get people to join the revolution. “Craft” is completely unrelated to action. Even if an argument is “well-crafted,” the craft part is the part that’s rhetorically neutral. Craft exists to create internal experience, and an internal experience might be persuasive in some way, but that depends on use. “Art” is more akin to discourse. Discourse is characterized by open-ended argument. Discourse is about “I think that this is the way things are or should be,” but it does not singlemindedly (virulently) exist to reproduce itself in the way of propaganda. Number 4 and 5 on my list seem clearly related to action because understanding reality is related to action (even if it’s not the ONLY thing that leads to action by any means). If I think all poor people deserve their lot I’m not going to care much about poor people even if no one is telling me to burn their houses down. None of this is a statement on what art “should” do, or whether it’s good at doing any of the above. Oh oh oh *raises hand* see also Kevin Simler’s take on what advertising does, Ads Don’t Work That Way – if we acknowledge “informing social information” as a function of advertising, rather than “directly motivating action,” then art seems to have this effect constantly, especially popular art (and subcultural art on its subcultures, even elites). So (for instance) at the beginning of Magnificent Seven, when Yul Brinner’s character conducts the body of Old Sam to the cemetery, his character is both being established as a good guy, and also re-establishing social information – the new sacredness emerging at the time, anti-racism. I think of art as like a raindrop or snowflake that forms around a piece of dirt, and the dirt is the argument. An argument can be politically based without being “propaganda.” Spike Lee makes politically charged movies, but they come from a place of him having a conviction about the world being a certain way, and not from a place of sacredness (haven’t seen The Magnificent Seven, so can’t really comment on that!). Great post! I should have known to think of an explanation based on social co-construction, having read enough of your work. I want to make a bit more of a distinction between “art leading to action” and propaganda. The phenomenon that I’m trying to get at is not so much a function of the intention behind propaganda-style art, but that artistic experiences that feel completely life-changing (regardless of the artist’s intent) so rarely actually change your life, whereas advertising that doesn’t make you feel anything at all, or even makes you feel uncomfortable and aversive, can still lead to acting in line with the advertising. The best example from my life is when I went to go see Sharr White’s play The Other Place on Broadway. It’s about a woman who is a neuroscientist who starts getting dementia, and it was the best play I had ever seen up until that point. The idea of living through dementia had always terrified me after I saw my great-aunt go through it when I was younger, and I resolved afterward that I would devote my life to, as I called it, “fighting the darkness” (in reference to a great poem on the same topic, Edward Hirsch’s “Lay Back the Darkness”). But the feeling subsided and now, instead of doing research on medicine or making a job that makes enough money that I could contribute to the cause, I do theater. Sharr White wasn’t writing a propaganda play trying to get people to go into medicine- I think he was more focused on the horror of this woman as she knows exactly what is happening to her but is in denial of the whole process. But the impact that it had on me felt like it was going to lead to some huge action. Advertisements are designed to exploit simple things that people already want to do, and then redirect behavior. (Hungry? Why not go to Burger King? You already want cheap fatty food, and now we’ve reworked our interior to look acceptably sleek and modern!) On the other hand, great stories often deal with decisions that have tremendous cost, and that you wouldn’t do unless they were reinforced by sacred community values (i.e. sacrificing yourself for loved ones, or changing the goal of your life’s work). The problem is that at every conscious moment we are being hit with information that intentionally or unintentionally guides our action, and thus the only interventions that reliably work will be tiny pushes in almost the same direction as the environment, as opposed to huge pushes. So art is the best candidate for achieving these huge pushes, but only insofar as you work to also modify your environment to conform with the push. Otherwise it will just get lost in a sea of conflicting forces. Think of three elements that go into compression: the raw data/ideas, the choice of what to highlight/emphasize in (lossy) compression, and the communication and justification of that choice. In a photograph for example, a jpeg compression might be tuned to emphasize features that exist at spatial scales that are normally of interest to humans. That one does not require communication, but in other cases you have to signal how you’re compressing. That’s style. I think what you’re calling “style” is the third element, it is not part of the compression per se, but something added to make the compression approach more legible. When a work of art (and compression) works, the style is elegant to the extent good/defensible choices have been made about what to include/exclude. This is not always a positive, because the choices are not always defensible across multiple contexts. So one curious kind of objective in art is to eliminate style (and therefore, a notion of “importance”, which means seeking the seemingly impossible goal of compression without choices about importance). Bruce Lee wanted to eliminate the notion of “style” (in the sense of the characteristic approach of a school) from his “style of no-style” that he was trying to develop. This is a reaction to style as a negative: “stylization” that ends up creating mannered art and too much exploitable legibility where the art is an element of a competitive striving. Lack of style in the positive sense is lack of cliche/tropes, a kind of unimitability, unexploitability etc. In music, it is being difficult for simple AI models to replicate what you do (computer-generated Bach, I’m told, is pretty good). One way to think of this is as use of free space. Say you have 100 bytes of raw ideas/data you want to communicate and 10 bytes to communicate in. You could use 8 bytes to communicate, 2 bytes of “style” to make the compression legible. Or you could 9/1 or 10/0 etc. This view of style brings up the cryptographic and steganographic aspects of compression. Might be worth exploring in the future. Three links I’ll leave here. One is my old post, Rediscovering Literacy where I tried to reconstruct literacy as compression/decompression ability. The second is James Gleick’s book, The Information, which has some very interesting thoughts on this stuff. The third is my a very similar notion of enactment style for live decision-making that I explored in Tempo, though that may not be apparent in my idiosyncratically technical definition. So Muhammad Ali’s “float like a butterfly, sting like a bee” is a style in the domain of boxing. In martial arts, that might actually be considered an exploitable style against a similarly skilled opponent. It is very revealing that in the rumble in the jungle against George Foreman, which some call the greatest sporting event of the 20th century, Ali dropped his butterfly/bee style and fought very uncharacteristically, in a style he later called “rope a dope.” In his way, he was working towards the same style-of-no-style that Bruce Lee was. I have a feeling, if you look at the most dense literature, you’ll see a similar progression away from style. There is a difference in art forms where you create something (an art object) as opposed to a performance that cannot be separated from the artist (as in dance or boxing or a style of clearing your inbox), but I am not sure what that is yet. I think that the degree of coupling between artist and art is another form of style- by knowing the history of the artist you get (a lot of) bits of information about how to interpret the rest. Arts that are truly embodied/inseparable from the artist (like acting and dancing) just make the artist’s past more evident, since most world-models are based on people-models.